Man oh man is there so much to love in this knock out New York apartment by the always-genius Steven Gambrel. If you’re a blue-lover, which I am, then this plush apartment is a dream home. And it definitely strikes the right chord between glossy glamour and measured traditionalism with rich contemporary finishes and classic architecture. Pale grey gloss wraps the paneled walls and covers the ceiling in the formal sitting room. And I love the textural contrast of the plushy tufted sofas and creamy drapes with giant leading edge trim against those slick surfaces. And there are three, count ‘em three, coffee tables in this living room because you gotta put that coffee somehere. Also basically no New York living room is complete without a games table, IMO, so that little sucker under the far window is right by me. And if you’re missing the double doors to the right, you’re missing everything. Hellloooo dining room. I have a very large obsession with a hand painted Chinoiserie papered dining room, but this grey-blue sweetheart is definitely tugging at my heartstrings. For me, its all about the conservations of the classic moulding in here – the giant dentils around the room and the fab-u-lous, curved, peaked pediment tablet above that stunning marble fireplace. With that kind of architecture, its obviously really tempting to slap those bad boys with some white paint, put up some green Gracie, and go all Queen Anne in here, but the softly contemporary finishes are what make that architecture sing. Love that flame-stitch patterned rug, the eglomise topped table, and that cool brass and glass chandelier. The wall textures are awesome with the contrast between the subtle gloss of the trim and fireplace side wall, the tight grid of the upholstered walls by the windows, and the super high gloss ceiling. The gorgeous blue library continues that glossy-versus-plushy textural contrast that’s in the other public rooms of the apartment but in a more pared-down and cozy manner. The tufted sofa echoes the sofa in the living room, and the midcentury Italian armchairs give some curvilinear attitude to this otherwise pretty traditional space. Obviously those double doors (leading in from the living room) are total perfection, glossed within an inch of their lives. And the brass light fixture is interesting and intricate without being fussy. Also, that grey on grey window treatment, with the little valance with a pleat and matching roman shade is killing me softly. You could go ahead and call this kitchen Fergie because it is glamorous, glamorous. I’m not sure if its also flouncy flouncy. I also apologize for this and any future Fergie references. I love a non-white kitchen – which I feel like are especially rare in New York because because want their city kitchens to feel bigger. But this black and white stunner is just as glossy and fabulous as the rest of the apartment. Yes to big subway tile with dark grout, yes to black and white floors, yes to stainless steel countertops (which I have been super into lately) and yes to colored-front Viking. 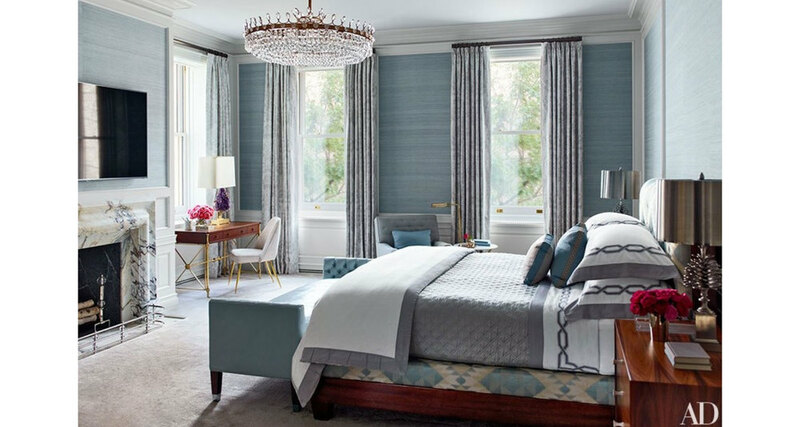 The master bedroom continues to layer on the nuanced grey-blues seen in this rest of the home. Textural grasscloth (or maybe they’re upholstered) walls and a marble fireplace echo the scheme in the dinning room. I love the deck of the custom mahogany bed (and headboard even though you can’t really see it in this shot) upholstered with the geometric, almost Navajo inspired fabric, giving a nice graphic shot-in-the-arm to this soothing space. Also, hey adorable desk and chair with your brassy legs over in the corner, I see you. Speaking of brassy legs, you know what this bedroom is killing it at? Mixing metals. Oh yeah. Double also, bless you for not hiding the tv. People watch tv in bed. Get over it. Oh baby, you know this is what I’ve been waiting for – the piece de la resistance – a Gracie paper clad dressing room. The creamy millwork and trim are a toned-down contrast against the glamorous wallpaper and help make the space feel comfortable and easy. An upholstered ottoman is de reiguer in a fance dressing room as far as I’m concerned, as is a lovely vanity, like the mirrored one here. Matching tape trimmed roman shades also keep the space from becoming too frou-frou (think about how tempting a balloon shade would be and how much better a roman is in here). All in all, this apartment is an gorgeous example of respect for traditional elements and playful use of more contemporary finishes – and it’s awesome.